Harvard University Press, 2015, p 372. In his novel, Day After Tomorrow, the Kenyan-born novelist Bahadur Tejani told the story of a family of Indian ‘waparis’, or settler-traders, and their interactions with ethnic African groups. The latter were ill-treated and abused as ‘racially inferior’, a category sanctioned by the colonial system. On one occasion, travelling on a steamer, the narrator’s father explains to him that the locals were made to board last “because they were Africans. Also third class passengers’. His father insists that he keep away from them, and learn the family trade instead. Tejani too, like others of South Asian origin, found himself an ‘outsider’ and moved westward. Sana Aiyar’s book, Indians in Kenya: The Politics of Diaspora, fills in the background to this story and others like it. It reveals the politics behind the fiction, the reasons why Tejani, and thousands of other Indians, left Kenya in the 1960s and after. Her detailed account begins in the 1890s, when East Africa became a Crown colony, although Indians had a recorded presence in the region since at least three centuries prior. The book examines the tumultuous decades preceding Kenya’s independence in 1963, and concludes in 1967, when Indians began to emigrate in large numbers. It’s a story of conflict between Indians and Africans – as in the 1890s, when prominent Indians regarded themselves ‘agents of British imperialism’ – but also of cooperation, as in later battles for fair wages or against racial laws that favoured White settlers. The “simultaneous existence of solidarity and friction” in this relationship, Aiyar says, challenges the accepted idea that Africans and Indians lived in mutually exclusive spheres. 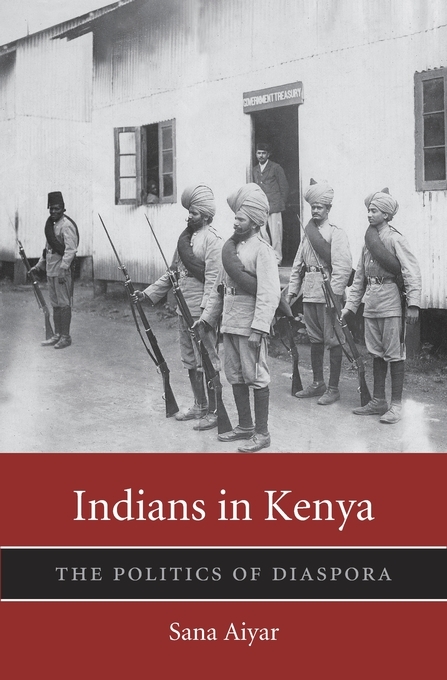 The British presence in Kenya toward the end 19th century was marked by the arrival of traders and businessmen from the Indian west coast in growing numbers. They were followed by workers, mainly from Punjab, recruited to build the Kenya-Uganda railway. Alibhai Jeevanji and Allidina Visram were traders who took full advantage of British rule. Jeevanji, first a railway contractor, moved profitably into construction, setting up low-cost housing units and market centres in Mombasa and Nairobi. Visram’s business activities followed the railway line as it spread into Kenya’s interior, and he conducted a thriving trade in cotton yarn, leather and ivory exported to India. Both men, symbolic of the more visible Indian presence in this period, were ardent advocates of imperialism, careful to demonstrate their superiority over the locals. For instance, they kept their distance from the strike in 1914, involving mainly Punjabi workers influenced by ‘Ghadar’ revolutionaries. Near the turn of the century, ‘settlers’ – Europeans from South Africa – arrived as spoilers, of a kind. The Europeans staked their claim to land allotments in the fertile highlands, demanded concessions to employ African labour on their farms, as well as other benefits. The colonial state was indulgent of these racial demands, and Indians, for instance, were barred from owning land in the highlands. Despite being new arrivals, the Europeans had more seats in Kenya’s legislative assembly. The blatant racism of the colonial state drove politically conscious Indians and Kenyans together for the first time. By the second decade of the 20th century, migrants from India comprised not just labour but also petty traders (the ‘dukkas’), bureaucrats, teachers and lawyers: A politicised middle-class able to reach out to its Kenyan counterpart. Aiyar tells the story of Manilal Desai, a lawyer and journalist, who followed the nationalist movement in India, and wrote articles calling for Indians in Kenya to collaborate with ethnic Africans to fight for similar concessions. He was known for his association with Harry Thuku, an activist campaigning for fair wages for ethnic African workers, but whose friendship with Indian leaders made him a suspect figure among his own Kikuyus. A painting by Zarina Patel depicting Makhan Singh, an Indian-born labour activist and pioneer of trade unions in Kenya. India’s independence brought on a Nehruvian effort to connect with other peoples engaged in anti-colonial struggles, especially in Africa and Southeast Asia. (Though Aiyar underlines the complexity again, as Partition also split the Indian community in Kenya.) In the late 1940s, the Indian high commissioner, Apa Pant reached out to Kenyan nationalists, and Indian-origin lawyers like JM Nazareth and Pia Gama Pinto worked with Kikuyus for improved land rights and greater representation in the Kenyan Assembly. There is also the tragic figure of Makhan Singh, who was instrumental in setting up Kenya’s first trade union and the East African Trade Union Congress in 1949. Singh’s championing of Kenya’s independence in 1950 led to his eleven-year incarceration in a prison camp: the longest in that country’s history. The Mau Mau rebellion, waged against the state and settlers by certain Kikuyu groups between 1952 and 1955, simultaneously created unity and rupture between Indians and Kenyans, and among the Kikuyus themselves. After the colonial government came down hard (and Aiyar’s narrative here is very dramatic) on Kikuyu activists, Nazareth and other Indians defended them in court. Aiyar’s account stresses the Indian side of this story (thus the many conflicts that played out among the Kikuyus themselves don’t figure) but the Indian story is one that has long been sidelined in post-independent Kenya. Aiyar resurrects it in painstaking and necessary detail. The sense of unity was shattered in the years leading up to Kenya’s freedom (uhuru) in 1963. Independence brought with it an inevitable ‘Africanization’, and the ‘outsider’ status of Indians was made clear by new laws relating to immigration and trade licensing. This, in large part, was what sparked the exodus that began in mid-1967. But the situation wasn’t straightforward and Aiyar brings in more detail. Indians weren’t just pushed away, she explains, by discriminatory laws, but also pulled, as they still considered themselves ‘Commonwealth citizens’. While the Kenyan bills created insecurity, the issue played out on other levels – including in the British parliament, which debated whether to admit Indian immigrants, despite their rights as subjects of the Commonwealth. The study of Indian diasporas is a recent undertaking. There has been scholarship on Asians who moved westward, part of colonialism’s forgotten movements: the lascars, ayahs and students in Michael Fisher’s Counterflows to Colonialism: Indian Travellers and Settlers in Britain: 1600-1857. Other studies have focused on ‘circular’ journeys across oceans and seas. 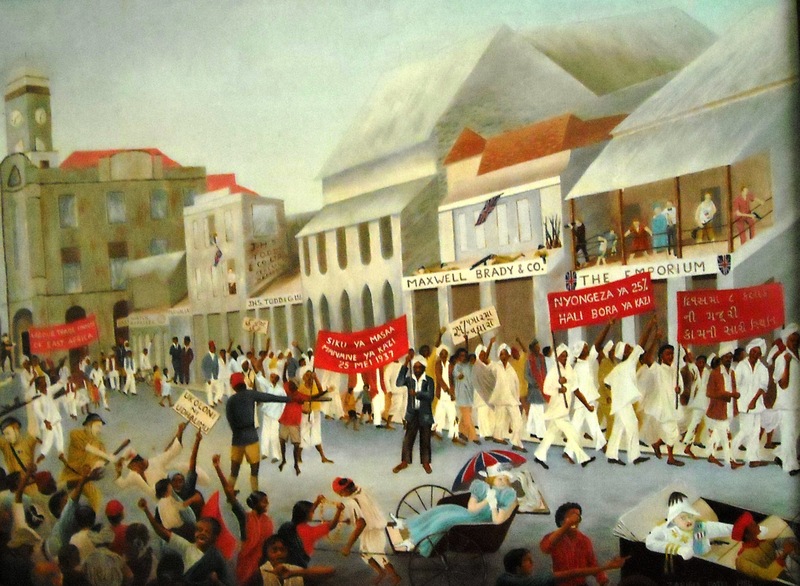 The Indian diaspora in the West Indies too has received new attention, from academics and fiction-writers alike. This is a story that began first with indentured labour (girmityas) but has since focused on different aspects of the Indian presence. Tejaswini Niranjana’s Mobilizing India, for instance, tells about girmitya women and their descendants, the traditional songs that helped them foster community and created a sense of belonging. The very word diaspora implies connections with a homeland, and Aiyar’s book takes on the complex connections with a historic homeland, the search for identity in a new one, and all the conflicts and contradictions this involves. Packed with dates, data and drama, Indians in Kenya is the story of a diverse community in multiple phases of its existence. Although it ends in the late 1960s, and hardly has anything on the ‘domestic world’ that made, for example, the largely endogamous Indian community frown on interracial alliances, Aiyar records the pervasive Indian influences that have continued: in music, in sport, and even during the tragic 2013 terror attack on Westgate mall in Nairobi, where Indians were prominent among the victims, and among the rescuers as well. Anu Kumar is a writer and in the MFA program in writing at the Vermont College of Fine Arts.